AHC President David Moss interviewed Archbishop Raymond L. Burke in La Crosse, Wisconsin on Aug 5, 2010, on the topic of the election and vocation of the Jewish people within the Catholic Church. An interview with Petra Heldt, head of the Ecumenical Theological Research Fraternity in Israel and proud friend of Israel, on Christians in Israel, dhimmitude and Sharia law, and Jewish-Christian relations. Part I: Israel and the Church from Abraham to Today - The origins of Israel: the Patriarchs; the Exodus and Mount Sinai; the kingdom of Israel; exile and return. Hebrews, Israelites and Jews. The Messiah and his rejection by his own people. The birth of the Church. Early Jewish-Christianity, the growth of Gentile Christianity, and the parting of ways. Israel in the patristic writings: the rise of "replacement theology." Christian anti-Semitism in the Middle-Ages. Theological evaluation: Israel and the Church in the New Testament. More than any other pope, John Paul II was the twentieth century’s greatest papal friend and supporter of the Jewish people. Indeed, John Paul II’s extraordinary relationship with the Jews was an important chapter in the historic legacy of his pontificate, which has had profound implications for Catholic-Jewish relations in our time. There are no disagreements between Judaism and Catholicism. Where their teachings diverge, it is because they apply to two different, well, let’s call them universes, two ways that human experience is unified (uni-verse, “turned into one”) in relation to G-d according to their respective covenants. "The permanence of Israel (while so many ancient peoples have disappeared without trace) is a historic fact and a sign to be interpreted within God's design." Jesus Christ suffers in the passion of Israel. In striking Israel, the anti-Semites strike him, insult him and spit on him. To persecute the house of Israel is to persecute Christ, not in his mystical body as when the Church is persecuted, but in his fleshly lineage and in his forgetful people whom he ceaselessly loves and calls. In the passion of Israel, Christ suffers and acts as the shepherd of Zion and the Messiah of Israel, in order gradually to conform his people to him. On the Diverse Realities that go under the name "Israel"
If we wish to grasp the meaning of God's Plan in history with regard to Israel, we must go far beyond the issues relating to the present political Israel or any other temporal vision regarding Israel. We must grasp the role Israel has in God's Plan in the last days of history, wherein we have entered with the end of the time of the nations and the beginning of the time of Israel as God’s nation called in the end times to accept Messiah. An organization researching the history of Pius XII's relationship with the Jews says that a series of documents recently uncovered show a pattern of direct actions by Archbishop Eugenio Pacelli (the future Pope) that culminated in the establishment of the modern State of Israel. 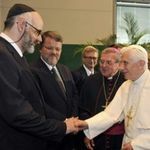 Pope Benedict XVI said any minimization of the Holocaust was unacceptable, especially for a priest, as he met with Jewish leaders in hopes of ending the rancor over a bishop who denied 6 million Jews were killed by the Nazis. "May the Names of These Victims Never Perish." Here is the text of the address Benedict XVI gave on May 11, 2009 at the Yad Vashem memorial to the victims of the Holocaust. Benedict XVI calls the Shoah "a Crime Against God and Against Humanity" and reaffirms that "the Church draws its sustenance from the root of that good olive tree, the people of Israel, onto which have been grafted the wild olive branches of the Gentiles (cf. Rom 11: 17-24)." "Strengthen Our Common Hope in God in the Midst of an Increasingly Secularized Society." 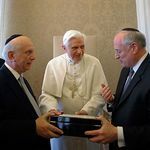 Here is the address Benedict XVI delivered on September 22, 2011 to a gathering of representatives of the Jewish community at Berlin's Reichstag Building. "Our Two Communities Are Challenged to Engage People of Good Will at the Level of Reason." Here is the text of Benedict XVI's address during a courtesy visit to the "Hechal Shlomo" center, seat of the Grand Rabbinate, after he visited the Wailing Wall in Jerusalem. Even if you are unable to help us financially, you can support our work by your prayers! The needs, challenges and difficulties of the work of the Church in the Holy Land seem at times overwhelming, and they cannot be sustained by human strength and wisdom alone. Your prayers are crucial to this important apostolate. Purim is a day of ecstatic rejoicing, which the Jews celebrate as both a sign of G-d’s enduring love and a promise of their final salvation. There’s nothing in the holiday that contradicts Christian faith, except for one thing: it usually falls out smack in the middle of Lent. The history of the relationship between Israel and Christendom is drenched with blood and tears. It is a history of mistrust and hostility, but also - thank God - a history marked again and again by attempts at forgiveness, understanding and mutual acceptance... Can Christian faith, left in its inner power and dignity, not only tolerate Judaism but accept it in its historic mission? Or can it not? Can there be true reconciliation without abandoning the faith, or is reconciliation tied to such abandonment?